Garden’s last hurrah: nectarine basil preserves (+ a salsa). It’s September, and the weather is changing. My little herb garden is still growing, but it’s struggling. I know it’s short-lived: the temperatures are dipping down into the 50’s at night, and they’re starting to show the signs that it’s too cold for them. So I’m using every last bit that I can. Making sauces & throwing in extra basil, making cilantro rice, and making rosemary-herbed chicken. Because before I know it, I’ll be drying them all for use over the winter. When I was a kid, this time of year used to depress me. Back at school for weeks already, time in the pool getting cut drastically short (or disappearing altogether), the weather changing, etc. As an adult I find it doesn’t anymore… sure, I miss the summer. But after long, swelteringly hot days where my face feels like it’s melting off, I look forward to the coolness of the fall. The quietness. The changing leaves. The awesome fall TV lineup. The ability to bake a cake & not have it be too hot to breathe or have the frosting form nothing but a sad, pathetic puddle of sugary mush. I definitely always miss my garden once the fall weather moves in. Using dried herbs just isn’t the same. And I miss all the fresh produce, too. But right now… it’s still just warm enough, and it’s all still fresh. I mean, come on… really now… they’re insanely beautiful! I made the following recipes after receiving a second massive box from the Washington State Stone Fruit Commission. You might remember that the last time it was a huge box of beautiful peaches. This time, it was half ‘Sweet Dream’ peaches, half ‘Honey Royale’ nectarines (shown above); grown in an orchard right outside Yakima, Washington. They were so stunningly picture perfect, I couldn’t help but snap some photos before they were gobbled up. 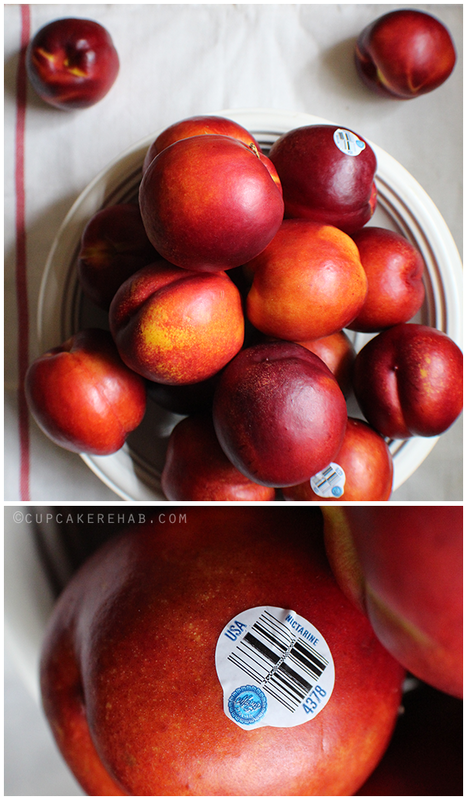 The nectarines were so big & perfect they almost looked like apples! Just gorgeous. I swear, I have never seen such beautiful fruit before. Not even at farmer’s markets, or gourmet food stores. The fruits I’ve received from them have been some of the best produce I’ve ever had. So of course, after I took photos… a few of them got eaten fresh. And my parents took some. Gave a few to lucky neighbors. And the piles of fruit that were left were all for me to play around with! The first recipe I’m sharing is something I found at Punk Domestics. Originally, it was Hungry Tigress’ recipe for lemon nectarine basil preserves that I saw & I decided it was absolutely the right thing to do to use up some of these nectarines & my beautiful fresh basil. I made my own version of the recipe & the rest is history. 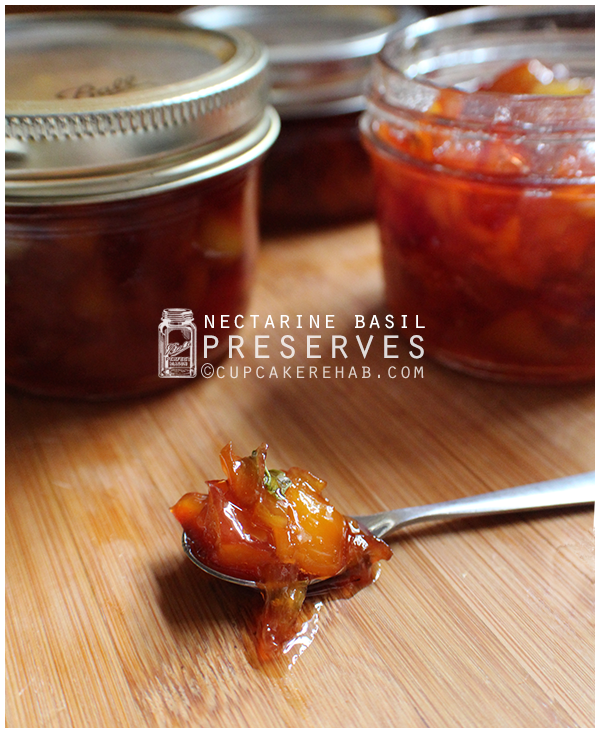 Nectarine basil preserves! Genius, I tell you. 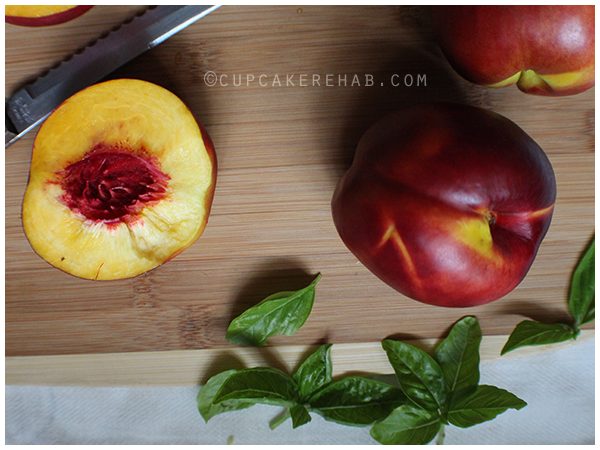 Basil & nectarine are perfect together. It’s also great as a last hurrah of summer. In a few days, on September 22nd, it’ll officially be fall. But right now… it’s still technically summer! See last time, the peaches were the stars of the show. They got plenty of air time around here. 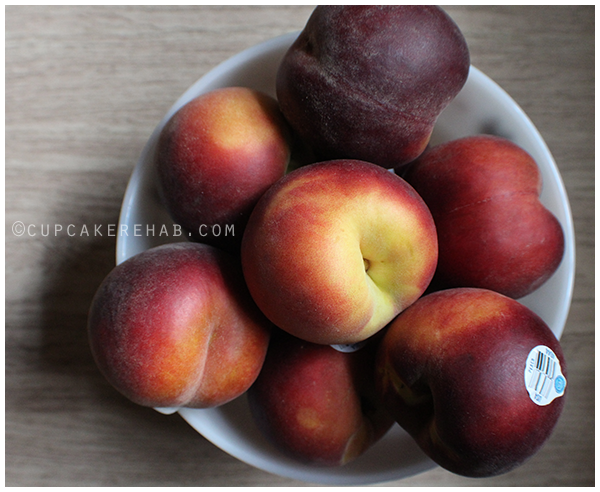 So this time, I’m going to be talking about these nectarines predominantly… although yes, the peaches will get another few minutes of face time in this post, too. But for now: nectarines! The juiciest nectarines, ever, mind you. A cool thing about nectarines that not many folks know is that the skin is so high in pectin, you really don’t need to add any. Just chop ’em up, and throw ’em in a pot. Easy peasy. Unless, of course, you don’t like the texture. In which case feel free to peel them & add a bit of extra commercial pectin. Sterilize your jars & lids, etc, etc. Keep jars warm. Put the nectarines, sugar & lemon juice in a large pot. Put it on simmer & let it simmer for anywhere from 30-45 minutes, stirring occasionally. It should have gotten softer & thicker by the end of the 45 minutes. If not, continue simmering until it passes the set test. Once the set test is reached, stir in the basil leaves until thoroughly mixed in. Ladle into jars leaving 1/4″ headspace. Process in a water bath canner for 5 minutes. Remove from water bath and after 12 hours, check the seals. If any aren’t sealed, pop ’em in the fridge & eat ’em right away. Honey Royale peaches are a yellow-fleshed nectarine variety that have a high sweetness & low acidity, so I recommend bottled lemon juice because it has a more even tartness. 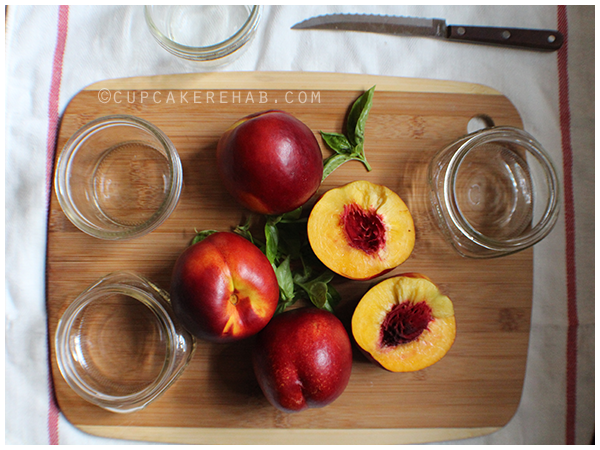 If you’re using a nectarine with a higher acidity, then you can up the sugar a bit. The second BONUS recipe was a suggestion by my mother. 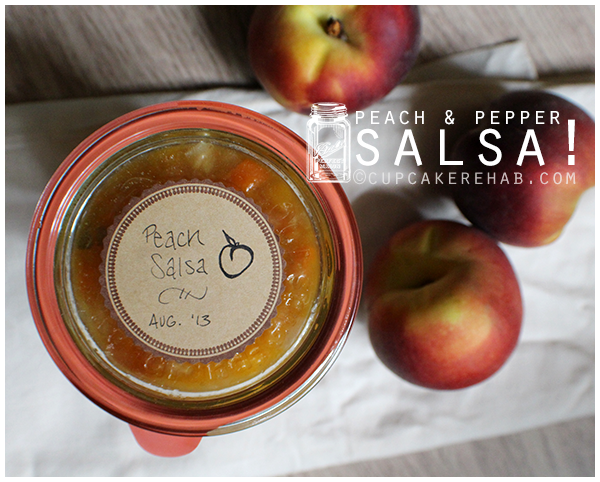 She found a recipe for peach salsa & asked me to make some for her before I even got the second shipment of fruit. So once the box arrived, I knew I definitely had to do it! Besides being an opportunity to put up some of this beautiful fruit, it was another opportunity to use the fresh herbs in my backyard before the fall sets in. I combined a few recipes to make one that utilized what I had on hand & the kind of salsa I wanted to make. Feel free to substitute any color Bell pepper, a different kind of onion or another kind of chili pepper in place of the jalapeño. Make it to taste. It doesn’t have to be canned, either, if you don’t want to. Just chill it in the fridge until you want to eat it! It only uses a few peaches, so it’s very small batch. Because of that, I used my new Weck jars, which are European & made in different sizes than most jars here, so my jar amounts will differ than yours (if you’re using Ball or Kerr jars, which you most likely are). In ounces, this recipe totaled about 31-32. It will vary depending on the size of your Bell pepper, etc. but that’s a rough estimate. 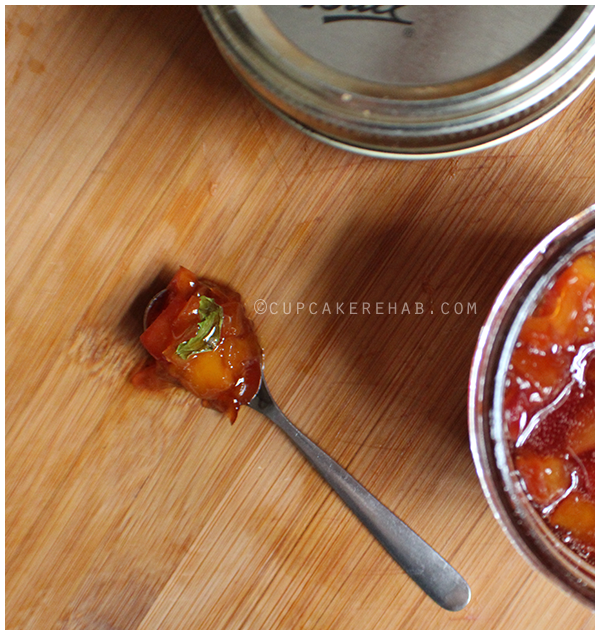 Sterilize your jars & lids. Keep the lids in a bowl of hot water (like I said above, I used Weck jars, so this is one step I didn’t do). Set aside. Combine the peaches, peppers, onion, lime juice, garlic, salt & vinegar. Stir together & add sugar. Bring to a boil. Boil for one minute, stirring constantly. Remove from the heat & stir in the lime zest & cilantro. Stir for a while, until everything is thoroughly mixed. Pour or ladle salsa into jars, leaving 1/4″ headspace. Place lids & bands (or place rubber gaskets, lid & clamps in my case) & process in a water bath for 15 minutes. Remove from the water bath, wait 12 hours, & check for seal. If not sealed, use immediately. I said it before, it’s easy to come up with great recipes or make awesome things when you have fantastic supplies. 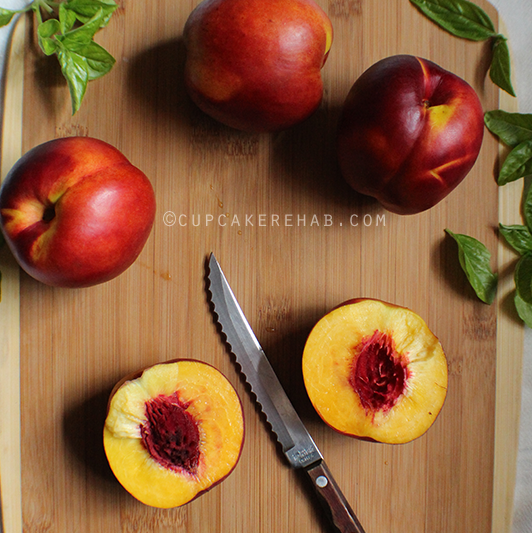 Just like the Honey Royale nectarines, these Sweet Dream peaches did not disappoint! Thank you all again. They’re on the sub-acid sweeter side, so I used more vinegar in this salsa than I would if they were another, less sweet variety. Keep that in mind! Also, you can definitely test a little of the salsa before putting it in the jars, just to make sure it’s okay. If it’s too sweet, add a bit more vinegar or lime juice; if it’s too tart, add a bit more sugar. But always add these things by the 1/4 or 1/2 teaspoon… better to go slow & be safe than ruin an entire batch. If you’ve never canned with Weck jars before, and you’re an experienced canner (or even a moderately experienced one), you have to try them. They’re a dream! Don’t get me wrong: I love Ball jars. I collect vintage ones, & I’ll never stray from them. But Weck jars are a totally different animal. I think it’s good to try new things in the kitchen; and experimenting with different ways to preserve & different materials is a good thing. They’re a bit more expensive than Ball jars… okay, a lot more expensive. But mine were gifts. If you manage to squeak out some extra bucks to spend on them or you decide to splurge, use this guide to help you start canning with them. Previous Post Peach bourbon black walnut crostata. Next Post Spiced bourbon. Need I say more? I didn’t know either until fairly recently! 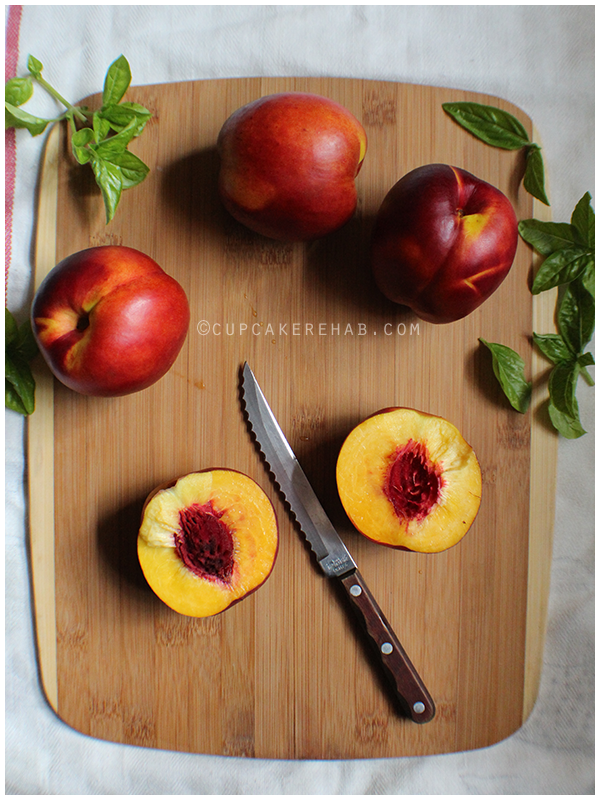 Its good to know when you’ve got super ripe nectarines that won’t hold up well to peeling. Just toss ’em right in skins & all! finally say thanks a lot yet again with your marvelous information you’ve shared on this site. mostly since you might well have done it in case you considered necessary. like my very own to learn very much more regarding this matter. front for those who browse through your blog. that professional assistance I have continually enjoyed going to your site. would never have been complete without surfing your blog. happy to help via what I have gained from here. I have been browsing on-line more than 3 hours nowadays, but I never discovered any interesting article like yours. It is lovely price sufficient for me. In my opinion, if all site owners and bloggers made just right content material as you probably did, the internet can be a lot more useful than ever before. I like the helpful info you supply to your articles. Il bookmark your weblog and check once more right here frequently. I am moderately certain Il be told a lot of new stuff proper right here! Good luck for the following! Youre so cool! I dont suppose Ive learn anything like this before. So nice to seek out somebody with some authentic ideas on this subject. realy thank you for starting this up. this web site is one thing that’s needed on the web, somebody with a little bit originality. helpful job for bringing something new to the internet! I do love the manner in which you have framed this particular issue plus it does supply me personally some fodder for thought. Nonetheless, through what I have witnessed, I simply wish when the feedback stack on that men and women keep on point and not get started upon a soap box regarding some other news du jour. Yet, thank you for this excellent piece and whilst I do not necessarily agree with this in totality, I respect the point of view. and I conceive this internet site is really instructive!